Image Size: 25 X 20 in. How much are you willing to sacrifice to follow what you believe? 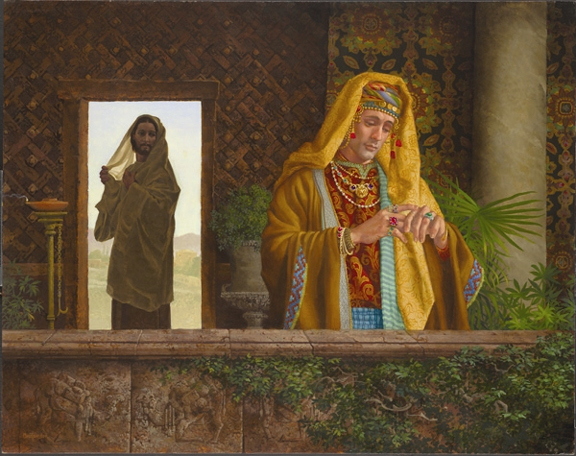 That is the dilemma James C. Christensen presents in The Rich Young Ruler. Christensen’s most popular scriptural works have focused on the challenge to live our faith, to give all that we have and to live in a state of thankfulness. Just before his triumphal entrance into Jerusalem, Jesus passed through a town where a righteous young man asked him what he could do to inherit eternal life. The young man told Jesus how he followed the Commandments and obeyed the laws of his people, but Jesus asked something more: “Go, sell everything you have and give to the poor,” he said, “and you will have treasure in heaven. Then come, follow me.” The home of The Rich Young Ruler is filled with symbols of both his success and his dilemma. The laden camels in the frieze in the foreground illustrate Jesus’ next words to his disciples, “It is easier for a camel to go through the eye of a needle than for a rich man to enter the kingdom of God. ”The ruler himself is richly dressed in fine fabrics and jewels and the room is filled with lush plants, which in a desert setting would be quite costly to maintain. Sputtering beside the entrance to the door is the ruler’s lamp that, like the flame of his belief, wavers in the wind. These symbols, combined with Christensen’s unique style, make The Rich Young Ruler an elegant story of difficult decisions and of a Master who will always look back and offer another chance.